Picking the right watermelon is quite an art. 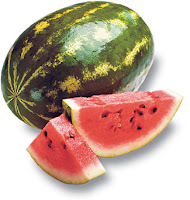 Go down the fruit and veg aisle of any Israeli supermarket and you’ll see a crowd of people surrounding the watermelons, placing their ears against the fruit and vehemently tapping away. The theory goes that if it sounds hollow, you’ve got a good’en. If you’re like me, you’ll find that they all sound hollow so you’ll tap, listen and then pick any of them. After taking a couple of rotten ones home, it was put to me that I should ask the supermarket assistant to cut a big one in half, have a taster, and if it’s good, take the half home (apparently this is perfectly acceptable supermarket etiquette). Whilst waiting in line for my watermelon to be cut, I chuckled at the thought that this was the only place in the whole country where Israelis were happily queuing up for an Arab with an extremely long knife! Who says we don’t trust each other?! yet again an example of the israeli obsession with fruits. here is a clip you might enjoy. it comes from a ozzy clips series called 'chasers war on everything', where they have their own way of testing the melons out.. Moved to Israel from England two years ago. I survive aliya by following some advice from the late great Alan Ball, England World Cup Winner (1945-2007) "I'm not a believer in luck, although I do believe you need it." Previously a political researcher and freelance writer, I now work in marketing in the dotcom world.